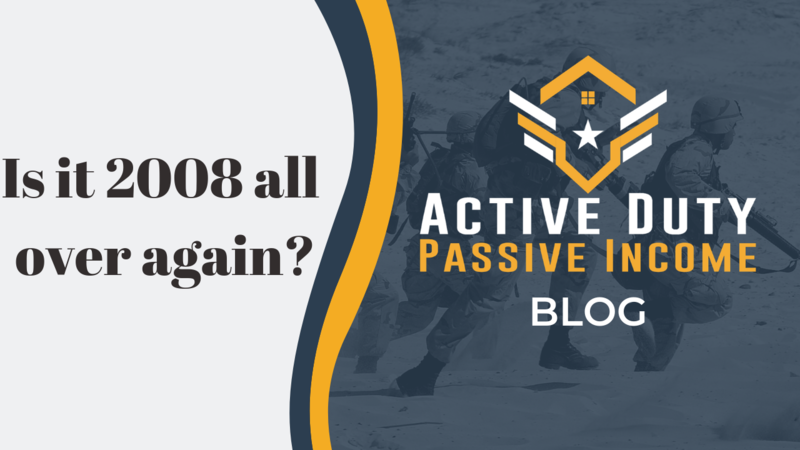 What does the FHA revised letter tell us about the coming recession? First, let’s talk about what the WSJ article says AND where they got their information from (I’m going to totally shock you and give original sources). WSJ got their information from this HUD Update released on March 14 outlining the reasoning and restrictions being placed on the Total Mortgage Scorecard and focuses its article on the number of people that the FHA will be excluded from lending through its restrictions. An increasing concentration of credit scores less than 640 combined with DTI ratios greater than 50 percent. Interestingly, the WSJ mentions each of these reasons except the #1 reason - cash-out refinancing. These are owner-occupants who are taking out new loans above the amount they currently owe in order to get cash in hand to do other things with. These aren’t HELOCs, a completely separate product, and it’s noted that these aren’t Streamline loans which are used to reduce interest rates on your existing FHA loan without going through full underwriting. What’s more, it’s these FHA to FHA loans that have the lowest average credit score at 658 in Q4 of 2018. The WSJ mentions high debt-to-income ratios and combined low credit with high DTIs comes only in the last paragraph of the article as an aside. Is it really any wonder though that debt-to-income ratios are increasing as a younger generation takes the lead in purchasing? According to 2018 NAR Generational Buyers Guide, buyers under the age of 37 make up the largest group of home buyers at 36% and those home buyers have high student loan debt and the lowest incomes. “...46 percent of buyers 37 years and younger that had debt reported having student loan debt with a median loan balance of $25,000. The share who have student loan debt declines as the buyer’s age increases. ” While the increase in risk is definitely evident, I have to wonder if perhaps higher debt-to-income ratios are simply the reality of the future as generational financial habits have changed over time and there simply exists more student loan debt today than ever before. In 2016 the FHA relaxed lending regulations to allow mortgage lenders to include higher risk applicants. This month the FHA has revised its Total Mortgage Scorecard to require manual underwriting on certain loans, meaning some people who could have gotten a mortgage in the last two years will no longer qualify due to more stringent rules. Based on the Quarterly Report to Congress Q4 of 2018 the FHA saw a continued trend of increasingly risky loans and put restrictions in place to decrease the number of risky loans being approved. 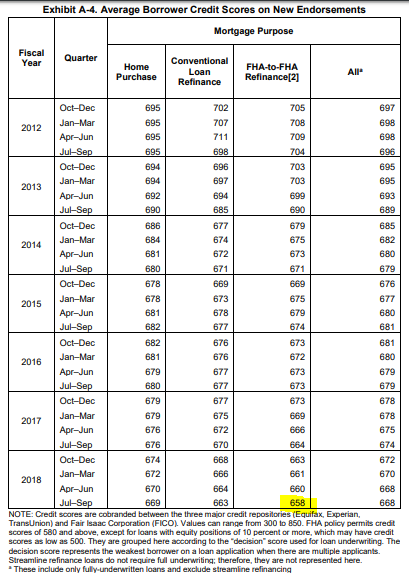 You can see in the graph below that the percentage of Borrower Credit Scores below 620 nearly doubled in the two years since lending was relaxed in 2016 from 6% to just over 12%. So where is the increased risk ACTUALLY coming from? To me, it seems the WSJ has glossed over the fact that much of the risk is coming from the cash-out refinancing of existing mortgages. This could be coming from a number of places - middle-aged owners pulling money out to pay off debts or for college expenses for their children or older homeowners pulling money out to use for luxuries like boats and cars while they still can, but it’s not likely that the cash out refinance is being used extensively by younger owner occupants. The risks with the under 37 crowd are that they are coming into their mortgages with lots of debt and somewhat lowered credit scores, but to their credit, they have years of potential and likely increased salaries over time to “bet” on. The risks with cash-out refinance to middle and older aged existing homeowners are that they are trying to leverage their homes without having maintained excellent credit and low debt to income ratios. Instead of being a sure bet, though, they are likely at or just beyond their peak earning years with retirement on the horizon. 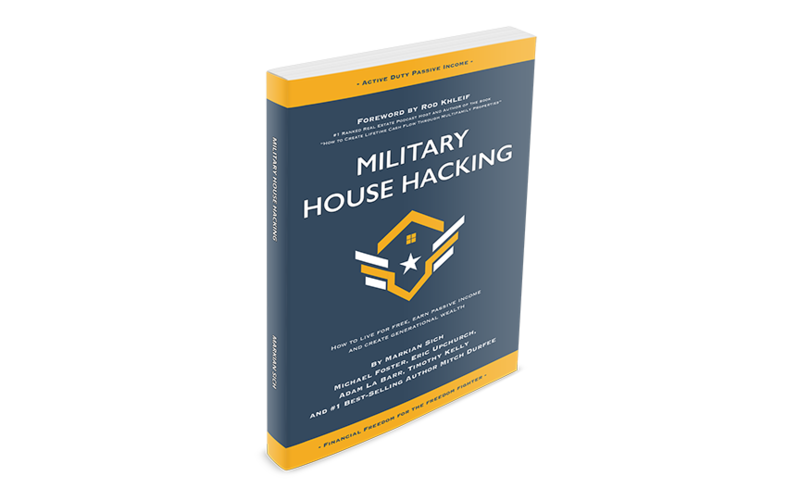 The FHA is doing its exact job though by creating stricter underwriting guidelines that will mitigate the risk of lending to both groups. How do we know if another collapse will happen? We don’t, but we can do some rational comparisons to check ourselves and keep collective panic in check. The truth is that all markets are cyclical so of course, we’ll have a downturn eventually, but the Great Recession was a bit more of a valley than anyone was expecting. 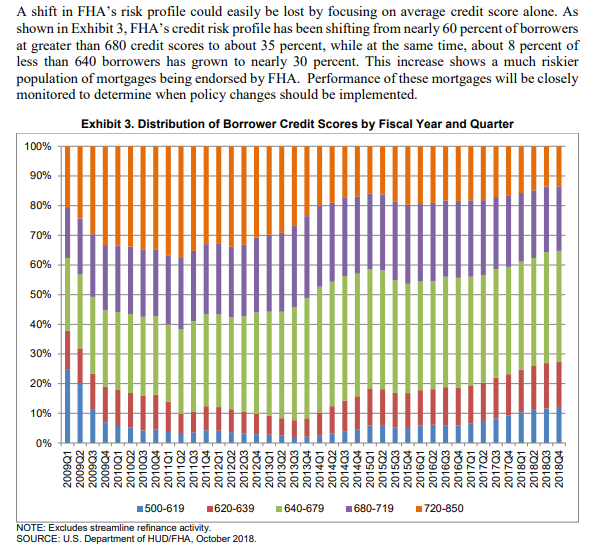 Apples to apples, here’s that same Quarterly Report to Congress for Q4 of 2014 (these reports are only available back to 2010) which notably remarks that in 2007, the eve of the 2008 collapse, almost 50% of total originations had credit scores less than 620. According to the 2018 Q4 Report (linked above, the graphic below) while we have seen an increase in lower credit scores originating loans, the percentage of loans in 2018 that were below 620 credit score was only about 12% as opposed to the nearly 50% in 2007. 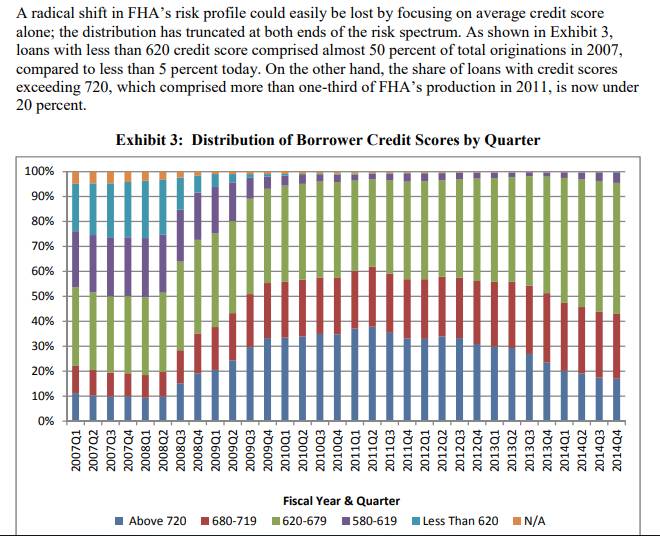 In 2011 the average FHA credit score was up above 700 to a decrease to the 670s is eye-catching, but I would be hard pressed to say that 12% is comparable to the 50% of risky loans being made in 2007. So, IS it 2008 all over again? I hardly think so. I think the FHA gave some leeway in 2016 and has seen that lead to an increased risk that it is uncomfortable with and is acting accordingly to ensure that we mitigate lending risk appropriately.